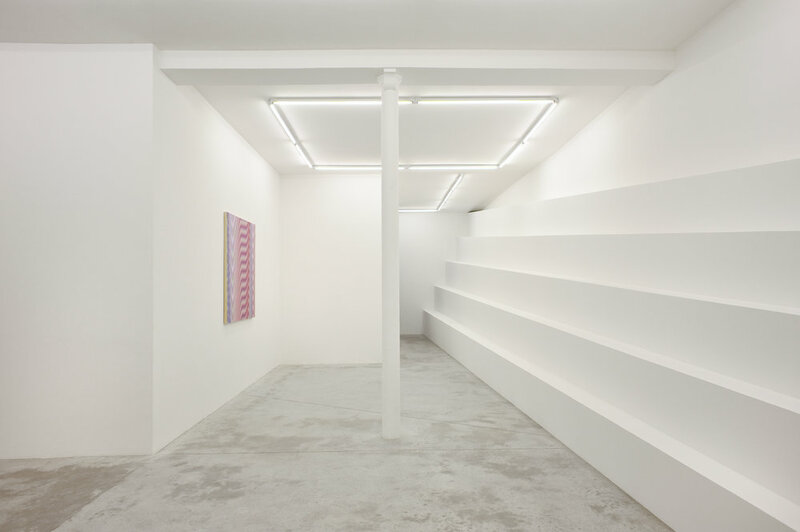 For his fourth exhibition at Praz-Delavallade, Philippe Decrauzat took over the gallery organising its space so that a wall sculpture confronts a series of paintings, like two separate signals broadcast simultaneously. The paintings are part of the On Cover series that the artist began in 2011. It was inspired by the cover of a copy of the Scientific American from 1963 (a scientific magazine for the general public) on the subject of moiré patterns and how science uses these graphic representations with, amongst other uses, their ability to reveal variations in a regular sequence, changes of rythm and interferences. On Cover has adopted different formats depending on the location: a black and white wall painting presented at the FRAC Ile-de-France/Le Plateau in 2011 and fragmented versions of the motif in a series of shaped canvas monochromes interspersed in several of his more recent exhibitions. 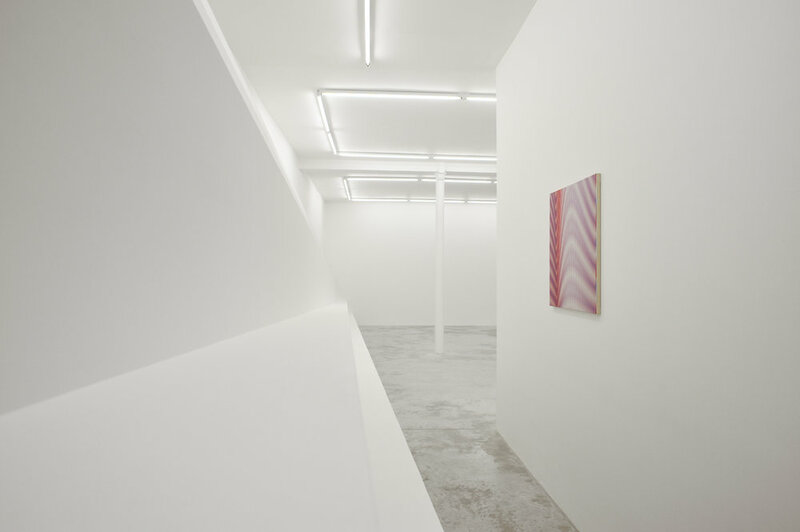 In this case, Philippe Decrauzat has created a series of three paintings, whose square format varies according to the different volumes of the gallery. Two coloured grid patterns are superposed to create a moiré effect. From one painting to the next, the tones vary imperceptibly in an interference generated by the same continuous curve. 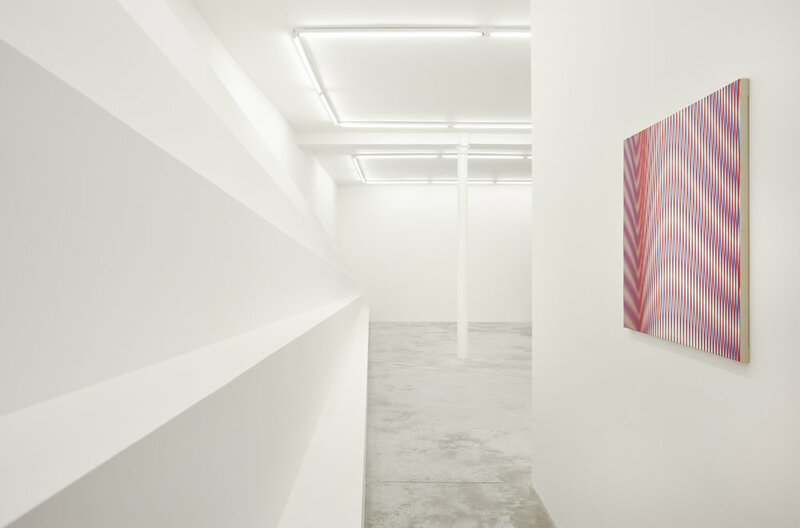 The paintings emanate from a single image and a single signal that extends out into the surrounding space in a wave-like image which encompasses the gallery wall, even though it is divided as the edges of each painting interrupt the succession of folds. Facing the paintings, a wall sculpture takes up the whole length of the gallery like so many points projected into space. The interpretations are many and varied: a staircase or rows or seats (depending on where you stand); a structure resembling the bellows used to focus early cameras; a way of using the gallery wall to put its interior volumes into perspective... It is both an architectural element and a viewpoint, one that concretises the role of the spectator, but takes his/her place as well. Rather than inviting the spectator to view it face on, the sculpture deviates the gaze and fixes it along its own axis in a way which is reminiscent of a vanishing point in perspective, but one situated somewhere outside the gallery walls thus guiding our eye away from the paintings and the scope of the exhibition, reinforcing this underlying feeling of something happening behind the scenes.